The final track on War, “40,” was released as a single in Germany. On August 20, 1983, U2 had performed at the Rockpalast summer festival at the Loreley Amphitheatre in St. Goarhausen, Germany. The festival is organized by German television station WDR (Westdeutscher Rundfunk) and televised in Germany. The band’s strong performance garnered much attention in the music press, and to capitalize on the situation, a single was pressed exclusively for the German market. “40” was released in 7-inch format with a note on the sleeve calling U2 “The discovery of Loreley ’83” in German. No other pressings of the single are known, in Germany or elsewhere. The version of “40” used on the single is a very slight edit of the album version, although it is not labeled as such on the release. The single version runs 2:35, editing out the initial musical sound heard on the album version. 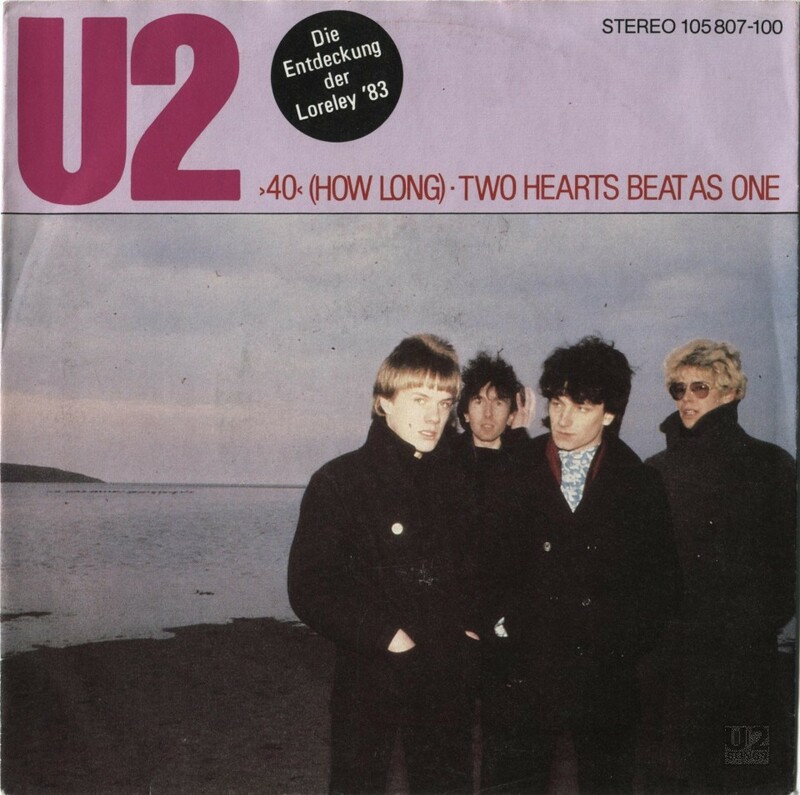 The B-side used for the single was “Two Hearts Beat as One,” which had not been released as a single in Germany. (The album version of “Two Hearts” was included, rather than the 7-inch edit.) No video was filmed to promote the “40” single. Interestingly, the song is listed as “40 (How Long)” on the cover of this release. Live, “40” made its debut during The War Tour, in February, 1983. Between that tour and the end of The Lovetown Tour in 1989, it would be the closing song for almost all of U2’s shows. During performances, Adam Clayton and the Edge would swap instruments, and as the song drew to a close, the band members would leave the stage one-by-one, leaving Larry Mullen, Jr. alone playing the drum riff from “40.” Snippets of the song would be played on The Elevation Tour in 2001, and it was played in full again during a number of shows on The Vertigo Tour in 2005. The song was not played on the U2360° Tour until the very last night of that tour, in Moncton, NB. Once again, Bono, the Edge, and Adam Clayton departed the stage one at a time, with Larry Mullen, Jr. being the last member on stage to close out the show. On the Innocence and Experience tour in 2015, U2 performed “40” a total of 17 times, at just over 22% of the concerts on that tour. The first appearance of the song was after the band lost long time tour manager Dennis Sheehan. Sheehan was known for going into the crowd to encouraging them to sing the “How Long” refrain after Bono finished. The album version of “40” has not been featured on any commercial U2 compilation, although it did appear on several promotional samplers. However, many live versions of the song have been released. U2’s live performance from The Rockpalast festival in St. Goarhausen on August 20, 1983 would later appear on the Under a Blood Red Sky album, along with live versions of “I Will Follow,” “Sunday Bloody Sunday,” “The Electric Co.,” and “New Year’s Day.” A version recorded in Paris on July 4, 1987 is available on the Live from Paris album, and a performance from Dublin on December 31, 1989 is available on the Love: Live from the Point Depot album, found on the iTunes-only The Complete U2. Finally, a brief snippet of “40” can be heard between “Bad” and “Where the Streets Have No Name” on a live performance from Boston on June 6, 2001. These were combined in a single track called “Bad/40/Where the Streets Have No Name” and included on some versions of the “Electrical Storm” single in 2002, and also appeared on the Elevation 2001: U2 Live in Boston DVD. In 2011, members of the U2 Fan Club were given the opportunity to vote on 46 live tracks recorded during The U2360 Tour, with the top 22 songs to be included on a live album, U22. “40” was one of these choices. In the end, however, the song did not receive enough votes to appear on the final live compilation. The following year, the Edge picked his favorite tracks from the remaining 46 live tracks, and “40” recorded in Moncton, New Brunswick on July 30, 2011 was included on From the Ground Up: Edge’s Picks. “40” (How Long): Produced by Steve Lillywhite. Two Hearts Beat as One (Album Version): Produced by Steve Lilltywhite.